It’s a Taco Kind of Day ~ $1 Taco’s @ Fuzzy’s Taco Shop Today Only (10/2)! 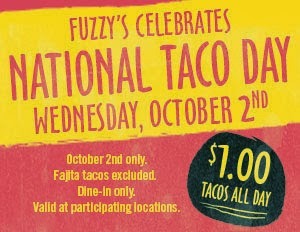 Celebrate National Taco Day TODAY (10/2) at Fuzzy’s Taco Shop and take advantage of the $1 Taco offer. Yes, that’s right. Taco’s are just $1 today only. Previous postFREE Taco from Taco Bueno! Next postFREE Popcorn @ AMC Theaters for Government and Military Employees!